Step foot in Downtown Nashville today and you can’t miss the million dollar hotels that have been built or are currently under construction in one of America’s fastest growing cities and hottest tourist destinations. In fact, the new Westin complex is nearing completion just a few short blocks away from the City Winery where Rock ‘n’ Roll Hall of Famer Don Felder set up shop for a night with his An Evening At The Hotel California program on May 22, 2016. 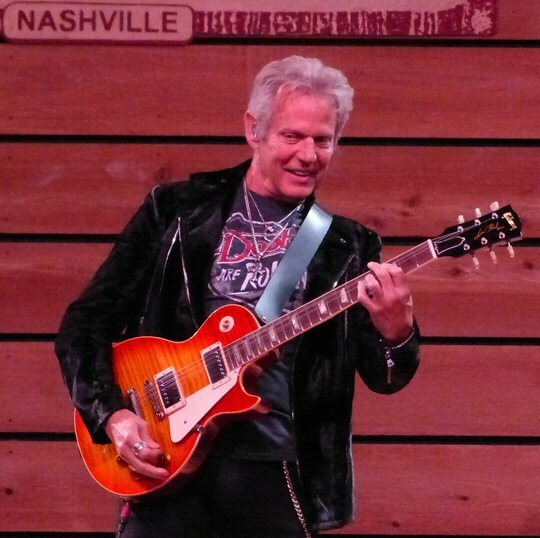 Don Felder and his high-flying band in Music City. So, was there space for one more prestigious “Hotel” on this night in Music City? The answer was both yes and no as Felder and his triple-A rated band provided one hell of a night for fans who made reservations and booked early. Otherwise, there was no room at the inn for this sold-out performance by the legendary guitarist who helped the Eagles soar to unparalleled heights in the 70’s and 80’s before being unceremoniously dismissed for insubordination to that band’s “gods” further down the road. Often times it happens that when rock stars stay at a hotel they’ll use a pseudonym. In like manner the guitarist known as “Fingers” never formally mentioned his former group during the evening but he did alternatively refer to them as the “Seagulls” or “Beagles” throughout the night. However, he did play their many hits to the delight of the patrons. They came fast and furious, too. Beginning with the always good “Already Gone” which saw Don right up front with his Les Paul Sunburst in solid voice with full-bodied support poured out by his proficient five-piece that got the night going nicely. Don Felder on electric guitar at the City Winery. “Thank you so much and welcome to a lovely evening here at the Hotel California,” Don said before launching into “One of These Nights” complete with smooth harmonies from the support staff. Next, Felder paid tribute to Fender master Stevie Ray Vaughan with a joyous jam on his “Pride and Joy”. Don included some tracks from his most recent record called Road to Forever. Next up was “You Don’t Have Me” with “Girls in Black” a little later. Both tunes proved that Felder can still pen satisfying and powerful tunes and we hope he will return to the studio soon as he’s definitely on the right path with his new stuff. “I thought you might like that,” Felder remarked after a terrific take on “Take it To The Limit”. Felder clearly enjoys these solo flights with his band made up of the best talent in the business. He stalked the stage with smiles and confidence as he delivered one of the most beloved catalogue in recorded music history. On mellower numbers such as “Peaceful Easy Feeling”, “Tequila Sunrise” and “Seven Bridges Road” – or more raucous tracks like “Victim of Love”, “The Long Run”, “Heartache Tonight” and “Life in the Fast Lane” – the audience response was enthusiastic and palpably overflowing with hospitality for the quality room service Felder and Co. was providing. 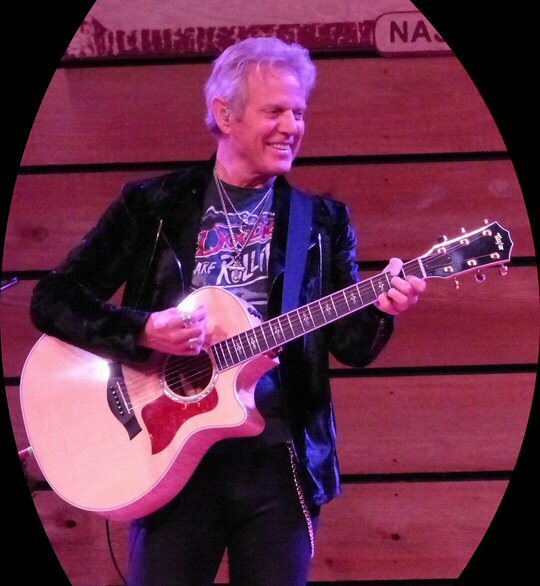 Don Felder on acoustic guitar at the City Winery. With the show now almost over only a little housekeeping remained. The obligatory “Hotel California” closed the concert but not before a very special guest in the form of Stygian Tommy Shaw was introduced. He entered stage right and proceeded to trade vocals and leads on the Eagles’ biggest song. Tommy is an Alabama native who spent the last two decades soaking up the sun in the Golden State. In an effort to return to his southern roots he recently settled into Music City for an extended stay in Tennessee. This marked a nice homecoming weekend for the renowned rocker as he and his band played with the Nashville Symphony on the previous evening. One thing you can count on when seeing live music at the City Winery is quality food & beverage. The entertainment space recently switched up their menu to stay competitive in this town now known as much for its “foodie” fare as it is for music. 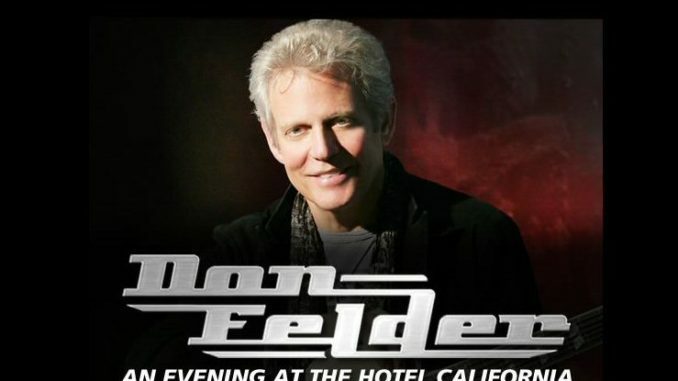 The up-scale venue continues to host an eclectic range of artists such as Don Felder. Upcoming events include The Zombies, Peter Wolf, Will Hoge, Robby Krieger and more. 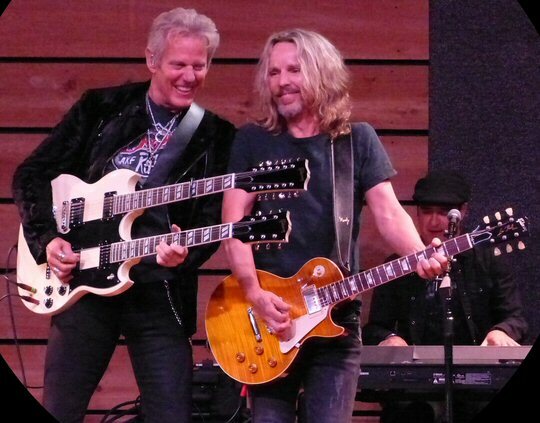 Don Felder and Tommy Shaw share some space on Hotel California.